With more than two days to spare, England began a Test series on a winning note for the first time in 15 attempts and won at Lord's for the first time since 2005 as they wrapped up a convincing 10-wicket success against West Indies. A positive sixth-wicket stand of 143 between Brendan Nash and Denesh Ramdin made England work during the afternoon session, but either side of that there was precious little resistance as they were left a simple target of 32. This was England's first victory in a live Test since they beat New Zealand, at Trent Bridge, last June, since when they have only once bowled a side out twice. This time England's bowlers shared the honours with Graham Onions adding two more scalps to his impressive debut haul, while Graeme Swann took his match tally to six and in the process removed Shivnarine Chanderpaul for the second time in the game. When the home side were beginning to get a little frustrated by the efforts of Nash and Ramdin, Stuart Broad made his impression on the innings with an impressive display of aggression towards the lower order which ended with the removal of Nash for a fine, gusty 81 that enhanced his battling reputation. At the end of one of the many frustrating days of toil in the Caribbean Broad pleaded for a pitch with some more assistance, so it was important that England made the most of conditions in their favour. However, what was particularly impressive was how a young unit worked together with the swing of Anderson being complemented by the extra bounce of Onions and Broad. Swann's return cemented his standing as England's premier spinner, and only Tim Bresnan - limited to seven overs in the match - was left without a real chance to make an impression, though he did take a fine gully catch to dismiss Fidel Edwards. After their horrendous collapse of 8 for 53 yesterday West Indies needed to restore some respectability but where always up against it. Showers delayed the start by an hour and initially there was some solid resistance from Lendl Simmons and Devon Smith. However, that all changed when Onions replaced Broad at the Nursery End and Simmons tried one of his favourite leg-side clip, but failed to keep the ball down and Alastair Cook snapped up a smart catch at square leg. Next over Swann was introduced into the attack to have a crack at his bunny, Smith, but he gained an even more valuable scalp. One ball after being cut away for four, as Chanderpaul escaped a pair, he found the inside edge and the ball ballooned off pad into the hands of Ravi Bopara at silly point. Chanderpaul's tally of four runs in the match was the lowest of his career. With the heart of the batting removed the collapse moved into top gear when Onions swung a beautiful delivery between Smith's bat and pad to uproot middle stump. Another promising innings was cut off and a swift conclusion was on the cards. However, during a bright and breezy afternoon batting became a little easier as the ball grew older. England did have their chances as Nash was missed at third slip by Swann off James Anderson before he had scored, then Onions missed a return catch offered by Ramdin on 38. After being offered their lives each batsman brought up half centuries, Ramdin with a strong cut over the off side - a shot he played well whenever England dropped short - and Nash with a cracking cover drive off Swann. Onions found life a little tougher as he sent down an expensive five-over spell that cost 40 and Andrew Strauss had to start rotating his options to try and find the breakthrough. The quicks fed Nash's favourite cut shot and their partnership came off 33 overs as the pair played in an attacking manner and, for the first time since their middle order was rocked by Fidel Edwards on the opening afternoon, England just began to lose their vice-like grip on the contest. Broad, though, began to get the ball to shape back at Ramdin and forced one through his defences into the off stump. Jerome Taylor played his shots after tea, but fell trying an ambitious sweep at Swann after misjudging the length. Taylor has plenty of Test runs in him if he can just marry some selectivity to his natural stroke-making talent. Sulieman Benn is a far less accomplished batsman and Swann made swift work of him with a lovely arm-ball, then Fidel Edwards was bounced out by the hostile Broad. It's the early stages of a long summer that will get much tougher, but England desperately needed to get back to winning ways. 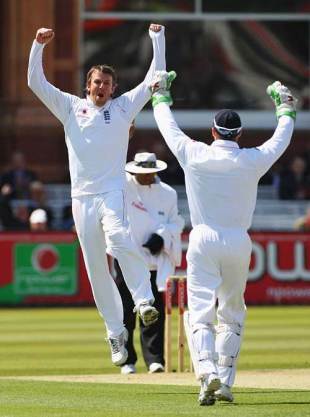 That they have done it in convincing style will be even more pleasing to Strauss and Andy Flower. It's far too early to call it a new era, but this wasn't a bad way to start.